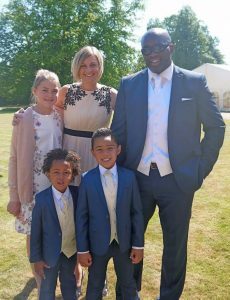 Our lovely model family ‘The Burton’s‘ are based in Milton Keynes and with 3 children and lots of energy they are always super keen to be selected and to be involved with any modelling work. Models Direct put them forward for a campaign with the NSPCC which they were successfully selected for and more recently The Burton family were chosen to feature in a promotional video for a local Estate Agency company in Milton Keynes – the opportunities are endless! The money can be great when modelling as a family too! As a parent you would always have to chaperone your child to a modelling assignment, so it’s a bonus if you are working on the same job together, instead of sitting and watching! “It was brilliant fun, the whole family was involved for this assignment which made it even more exciting! We would definitely love to do it all again. The assignment involved being filmed and photographed pretending we are getting the keys to our new home and then celebrating our new home with champagne on the balcony. The cameraman was great, giving us simple instructions and increasing our confidence. The most fun part of the assignment was watching my children have a great time with beaming smiles. We would definitely recommend it to other families – a great fun experience and you get paid, win, win! This entry was posted in Agent, Child modelling, commercials, Family Modelling, male model, modelling, Models Direct, Success Stories by The Models Direct Admin. Bookmark the permalink.